As with most large snack food corporations, Shearer's have taken a research and development approach to their new packaging. Black with a colour representing different flavors, with an enhanced photograph of some chips. It is very striking and easily spotted on the shelves, but it does lack a bit of character. A great Kettle Cooked Chip crunch. Firm, with sufficient air in the packet to protect the chips from breakage. The hardness and thickness was fairly consistent throughout the bag. A good texture, with minimal visible grease, and a rugged, ingredient popped feel. Plenty of flavors visible and feelable with tongue and fingers. If something says 'Hot Pepper Jalapeno' on the packet it should be too hot for a large proportion of potential customers. However, big companies don't take that risk and Shearer's are no different. They have however developed a really nice jalapeno variety. The aroma and the taste is a nice, mild jalapeno tinged flavor. 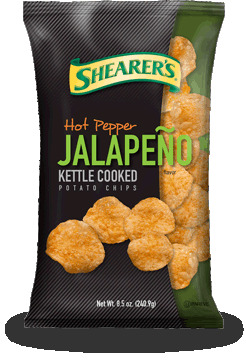 So, although contrarily very nice, they should not really be called Hot Pepper Jalapeno.